My last experience of traffic in Lagos was during my last visit in July/August 2012. I was staying at the family house in Festac, and I had to meet some people for my book business in VI. Now I know about the traffic situation, especially seeing that the expressway between Festac and most parts of the city was under construction. But before this time, I had always made it to where I was going within 2 hours, no matter how horrible the traffic. On this day, it was different. The car I was using was sandwiched between a rock and a hard place, and I mean that almost literarily. We had a container truck in front of us, dishing out dirty grey, and sometimes black, fumes. Behind us was a Hummer Jeep, it had a steel grill guarding its front. On both sides of us were long lines of other cars, trailing forwards and backwards as far as the eye could see. The driver debated routes, ones he should’ve taken, and others he shouldn’t have. But those were like crying over spilt milk. We were well and truly stuck. I wish I could tell you we were beamed away like the Captain in the Star Trek Movie franchises, or that the car suddenly developed invisible wings and took off, like in Ayodele Arigbabu’s sci-fi tale, but those would be lies. We managed to crawl slower than a snail in that jam for about 3 hours before we took the first exit we saw and made a bolt for it. 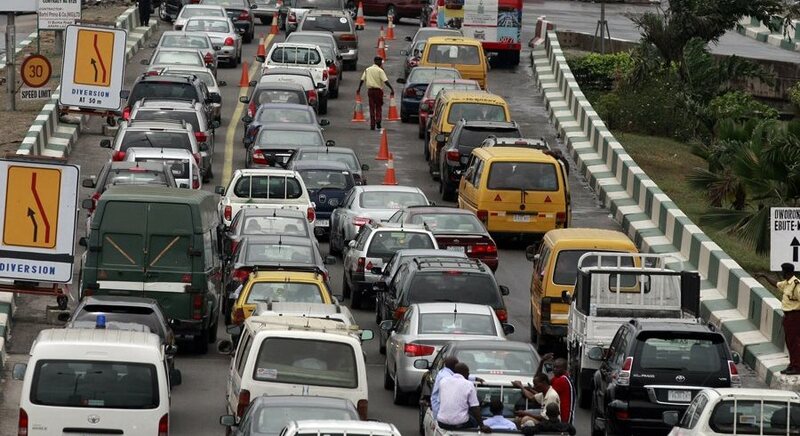 This post was motivated by Joe Omotayo, a fellow blogger who wanted me to write a short piece for them on Lagos traffic, and reading this post by Jemima. - 'Horn' when someone executes a dangerous manoeuvre. - 'Horn' when you're about to move off. - 'Horn' when you're about to overtake. - 'Horn' when someone is about to overtake you. - 'Horn' when turning into a road. - 'Horn' when emerging from a road. - 'Horn' back when someone horns at you. It's considered good etiquette. - 'Horn' when you hear a chorus of horns. Don't worry if you don't know what all the 'horning' is about. - 'Horn' when you're happy. - 'Horn' to the beat when you're playing music in your car. The rules, and Atala's addedum, have gone viral since, and can be found several locations online and in chain e-mails with or without additions and subtractions. I'm sure a lot of you have seen it, no?